Bill told us to head out to the bar on our own Saturday morning and to be out there at 8 am. We were moseying along when Bill came over the radio. “Don’t waste time getting out there,” he said. “You know how far to go.” We did. Jack took us back through the steep swell and I kept looking behind us for Bill and the pilot. We got right up to the line of breakers before we stopped, and we could see the four sailboats on the other side, waiting to come in. It would be a tough job getting us out and them in all at slack high tide. Finally the pilot boat came up behind us and Bill told us to wait where we are and let the set of breakers pass. 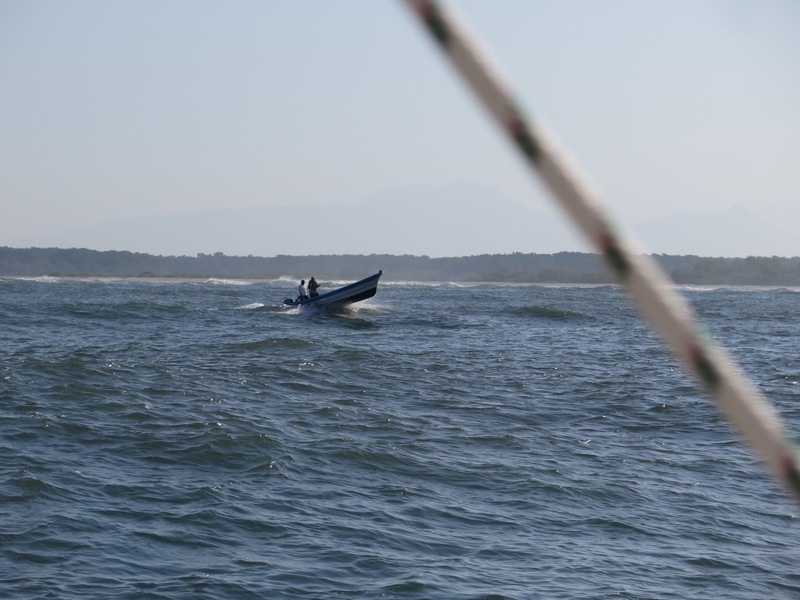 Then we heard, “OK, full throttle right now” and Jack gunned both engines and we motored toward the slightly flat water where the breakers had been moments ago. “Don’t slow down until you’re sure you’re out!” called Bill just as we passed the first of the sailboats and thought we might be well clear. We kept going and I turned and blew a kiss to Bill, who’s been our caretaker and along with Jean, our personal Salvadoran Wikipedia, and our friends. When we were sure we’d reached escape velocity from the warm tentacles of our Bahia del Sol interlude Jack throttled back and we were on our way. It was windless and calm for a couple of hours, then a beautiful breeze filled in and we raised the full jib and reefed main and settled in. 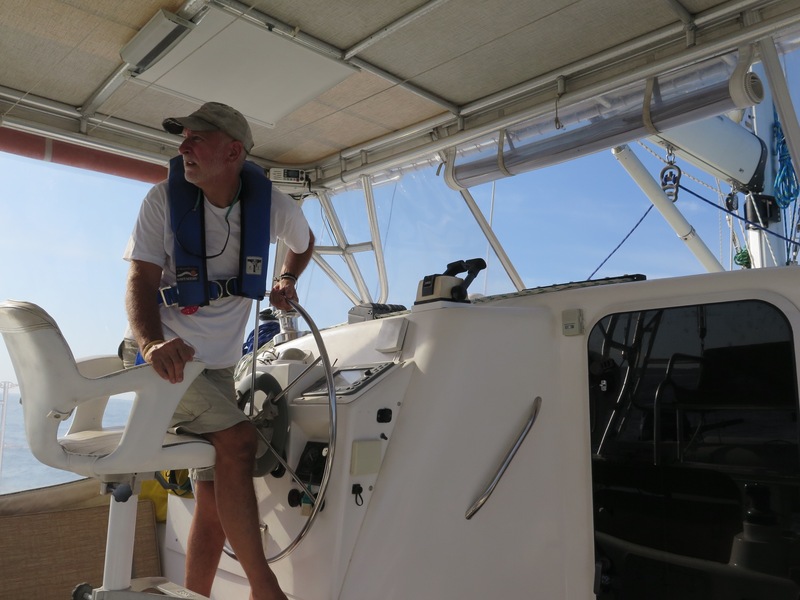 By mid-day the sea state was getting choppy and even though the wind wasn’t very strong the seas made life aboard uncomfortable and we put another reef in the main for a smoother ride. That lasted only a few hours when the wind died completely and we had to motor overnight. 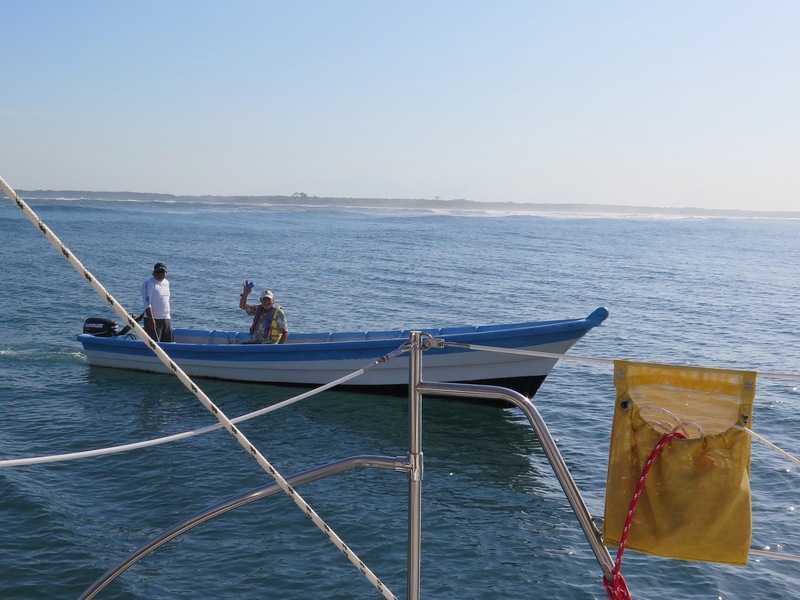 The pattern continued the next day, reasonably good wind but choppy seas during the day, no wind overnight. Plus we seem to be in an adverse current, despite our chart work and route planning before we left. Mal de mer hit me like a ton of bricks for the first time in a few years and I was nearly incapacitated Sunday. Jack took the first couple of hours of my night watch until I recovered enough to move about without throwing up. And while we were taking in the mainsail we were pooped by a rogue wave, fully dousing me and filling the cockpit with seawater. Our long-anticipated passage has not had the perfect start. We’re crossing our fingers that the seas settle down and that we get a fair wind soon. I imagine we’ll have a little of everything before this trip is over.